A decade ago, the collapse of Lehman Brothers marked the psychological low of the 2008 Financial Crisis. Equity prices bottomed a few months later, in March 2009. Hedge funds had nimbly managed their way through the 2000-02 dotcom collapse, which led to substantial inflows over the next six years. By 2008 AUM had quadrupled, as less discerning investors piled in. In my 2012 book The Hedge Fund Mirage; The illusion of Big Money and Why It’s Too Good to be True, I showed that although early hedge fund investors had done very well, they weren’t that numerous. The strong returns from the 1990s through 2002 had come with a much smaller industry. Consequently, hedge funds were far too big when the 2008 collapse came, and losses wiped out all the prior years’ profits. It meant that in the history of hedge funds, aggregate investor gains were offset by other investors’ losses. Hedge fund managers had profited; the clients had not. If all the money that’s ever been invested in hedge funds had been put in treasury bills instead, the results would have been twice as good. The Hedge Fund Mirage Turns Five showed that the book’s prediction of continued disappointment was right. Having rudely reminded investors in 2008 that they take risk, one might think that hedge funds would have gained from the subsequent rebound in risky assets. Endure the downside, participate in the upside. Since the low in 2009 the S&P500 has returned 17.9% p.a. With dividends reinvested, it’s increased almost fivefold. Although it’s unfair to expect hedge funds to beat long-only stocks at that level, they’ve missed by such a margin that one wonders who still seriously recommends an allocation to the sector. The Dow Jones Corporate Bond index has delivered 6.4% p.a., three times the 2.1% annual return of hedge funds, even with a decade of ruinously low rates. Although worse investments are hard to find, hedge funds handily beat a fund launched in 2009 to follow Dennis Gartman’s newsletter recommendations. Nonetheless, hedge fund managers have continued to do handsomely. 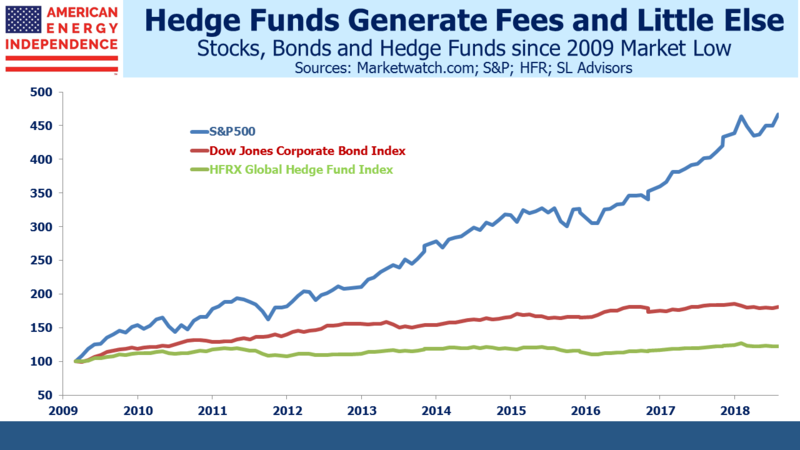 Some of the smartest asset managers run hedge funds and they are highly talented at separating clients from their wealth via fees (see The Alpha Rich List Got 15% of Everything). Try thinking of anyone who became wealthy by being a hedge fund client. Hedge fund AUM fell by half through the 2008 crisis, through investment losses as well as withdrawals from investors. Eventually some institutions saw through the false promises and left for good (see CalPERS Has Enough of Hedge Funds). But such is the attraction of investing with highly paid people that money flowed back in. Hedge fund promoters adapted their pitch. AR magazine, which published my original article on paltry returns, drew its name from covering the Absolute Return industry. When results showed that positive returns weren’t always assured, the goalposts were shifted and Relative Returns became the new mantra. But results turned out to be relatively worse than anything else. The shameless consultants moved to Uncorrelated Returns, which has turned out to be enduring since they’ve lagged just about everything outside of Venezuela. 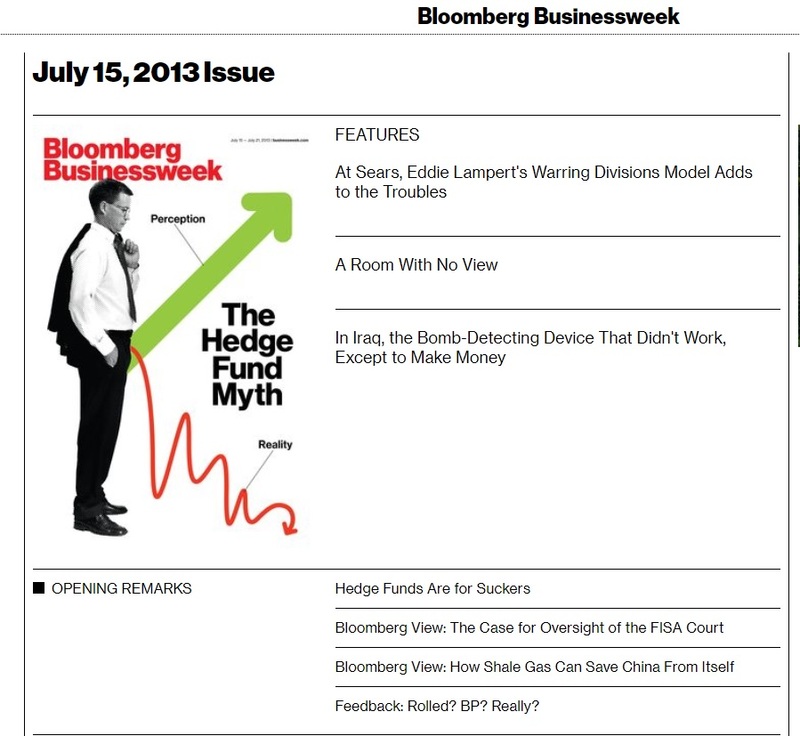 The July 2013 front cover of Bloomberg Businessweek needed few words. It’s therefore no surprise that David Einhorn’s fund Greenlight is making its owners far richer than its clients. Investors in his $1.7BN flagship fund have endured almost four years of miserable performance, with a drop of 36% since November 2014. Like virtually all hedge fund managers and the industry overall, Greenlight was better when it was smaller. Don’t blame David Einhorn. It’s a common story and he’s only the most recent former star to crash to earth. Einhorn must sincerely believe in his ability. Blame the enablers, the consultants and other advisors who drive clients to hedge funds. They still fail to recognize that high returns come from limited opportunities, and that competition from increased AUM drives them down. Last year Ted Seides (then, but no longer, co-CIO at Protégé, a fund of hedge funds) famously lost his 2007 $1million bet with Warren Buffett that hedge funds would outperform the S&P over the subsequent decade – and that was made before the financial crisis decimated stocks (see Buffett’s Hedge Fund Bet). Protégé owner Jeff Tarrant later argued that a decade of lunches and dinners with Buffett following the bet made it money well spent – and based on what an auctioned Buffet lunch goes for, he has a point. But drawing attention to hedge fund performance is rarely a good marketing strategy, so the Ted Seides bet was ill-advised. The poor guy must have actually believed he’d win, betraying a gaping absence of investment acumen and common sense. There are some thoughtful hedge fund investors around that add value for their clients. A few of them are friends of mine. They’re the ones who recognize the conflict of size with performance, adapting their portfolios to avoid the crowd. But the majority of hedge fund promoters orbit the truly talented to whom they only aspire, promising their gullible investors gold over the rainbow that they must know really isn’t there. We alluded to this in May’s newsletter. About to lose a $1MM bet with Warren Buffett over whether hedge funds could beat stocks over ten years, hedge fund investor Ted Seides has brazenly shunned obscurity and instead offered an amusing public justification. It can be summarized thus: although I lost money I wasn’t wrong. I’ll refrain from saying too much more, although Seides offers a target-rich environment. While the comments on articles are rarely worth perusing, the dozens already posted with his article offer a predictable real world riposte. Seides reminds me of a proprietary trader who once worked for me at JPMorgan. His trading losses were similarly not his fault, but were the unavoidable consequence of intelligent bets suffering from unforeseeable outcomes. He later went on to be a hedge fund investor (see Wall Street Potholes Pp 43-44). Five years ago this month John Wiley published my first book. The Hedge Fund Mirage; The Illusion of Big Money and Why It’s Too Good to Be True explained how hedge funds have in aggregate been a great business and a lousy investment. The opening sentence asserted that treasury bills would have been a better choice for the average hedge fund investor. This was a startling conclusion, since money had long been flowing to hedge funds in willful defiance of steadily worsening results. Surely, the flows were confirmation that the smart money was in hedge funds. Hedge fund returns are conventionally presented from the perspective of a single investment at the beginning of the period. Such an approach is far from reflective of the experience of investors, since few were fortunate enough to invest in hedge funds in those early years. From 1998-2002 hedge fund investors enjoyed great returns; there just weren’t that many investors. A more meaningful analysis considers everyone’s returns. For this, you need to look at the asset weighted return, or IRR; the return on the average dollar invested rather than the first dollar. The difference is most stark when percentage returns (the left panel in the chart) are recalculated and shown as actual investment profits (the right panel). Viewed this way, hedge funds have delivered mediocre returns at great expense. The high percentage returns of the early years didn’t generate much actual profit for investors, because the investors were few. They benefitted from exploiting many inefficiencies in financial markets without the burden of too much capital. Substantial sums followed with the misplaced hope of achieving similar results. The book was aimed not at hedge fund managers but at the stewards of this misdirected capital; hedge fund managers are an intelligent bunch and scarcely needed any advice. The goal was to help the star-struck institutional investors challenge the guidance of their consultants, and avoid high fee strategies that too often enrich the managers but not the clients. Five years is probably a fair period of time over which to assess the most important prediction made in the book, which was that hedge fund returns would be disappointing. This was a lonely view at the time – not as completely obvious as it should have been. The entire industry was being weighed down by the growing pool of assets it was managing. The availability of uncorrelated returns, which is what hedge funds try to provide, is finite; inevitably, dilution of returns followed. Small hedge funds outperform big ones. 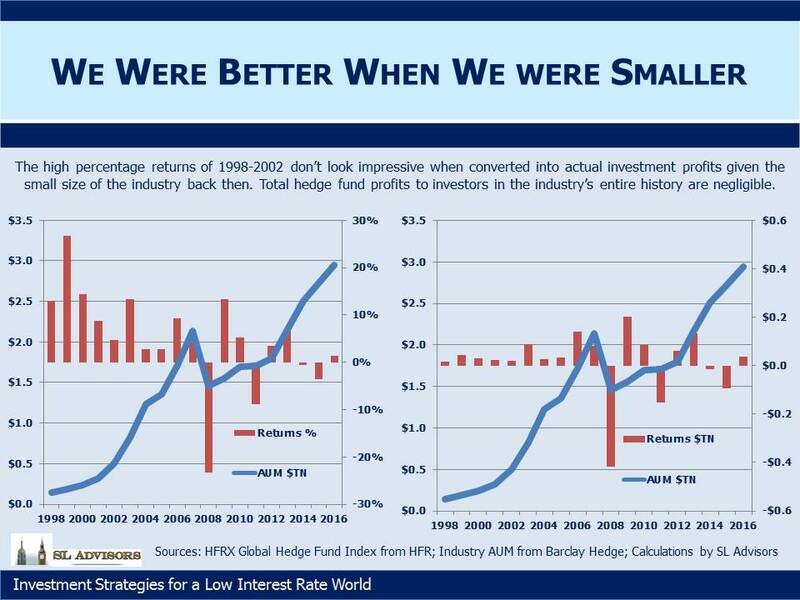 Any big hedge fund did better when it was small (which is how it became big). These first two insights are generally accepted, and yet very few investors take the third logical step in this sequence of thoughts – a small hedge fund industry generated higher returns than a big one. Hedge funds were, and remain, over-capitalized. Today, it’s not hard to find critics of the industry including some of its most successful practitioners. Assets are too plentiful and fees too high. This now passes for conventional wisdom although in 2011 that was certainly not the case. A disappointing consequence of America’s increasing political polarization is the tendency of each side to assume the other is intellectually challenged. I try hard to guard against this tendency myself, but have to concede that on the subject of hedge funds I have failed. Which is to say, the hedge fund professionals who praised The Hedge Fund Mirage when it came out, merely confirmed the superior investing intellect that their businesses had already demonstrated. The critics (who generally aspired to invest money rather than actually doing so) similarly confirmed their place at the other end of this intellectual spectrum. Hedge fund managers are by no means the villains in this story. Some of the smartest people around run hedge funds because that’s where the financial rewards are greatest. If every hedge fund manager sincerely believes their fund is the best, this is no different than individual business owners in any industry. Many managers have long recognized the challenges of asset size even while maintaining they could rise above the weight of mediocrity. The fault lies with those who aggregate all those optimistic individual views into a positive one of the industry without considering the obvious negative consequences of too much money. Not every institutional investor has the ability to run a hedge fund. Some of the least sophisticated investors I’ve ever met are the trustees of public pension plans. They understandably rely heavily on consultants to guide them, not just for their expertise but also because as fiduciaries their decisions are subject to scrutiny under ERISA (the Employee Retirement Income Security Act). Thomas Schneeweis, an academic and hedge fund consultant, descended from his ivory tower to criticize what he called “baby hedge fund analysis 101.” For the sake of investors everywhere, one must hope that his investment acumen surpasses his business building ability, ensuring few victims of any Schneeweis insight. In short, the critics were dead wrong. Although on average hedge fund investors have done poorly, there are great hedge funds and happy clients. There probably always will be. It’s not all bad. While it’s extremely hard to pick hedge funds, some investors are good at it. Some hedge fund investors focus on smaller managers where research has shown returns are higher. As hedge funds have become more generic their returns have become more prosaic. Success relies on leaving the well-traveled path and considering more obscure strategies. Perhaps the strongest criticism of The Hedge Fund Mirage is that inflows to hedge funds have continued when they shouldn’t have. The reason this has happened in spite of overwhelming evidence that disappointment will follow lies in some quirky accounting. Public pension funds (such as the $300BN California Public Employee Retirement System, or CalPERS) don’t use GAAP (Generally Accepted Accounting Principles) accounting like public companies. Under GASB (Governmental Accounting Standards Board), investing in riskier assets has the odd result of lowering the present value of your pension obligations. There’s no economic connection between the two, and the flawed underlying logic is slowly creating a massive problem. It’s why public pension funds are today’s biggest hedge fund investors, a folly that will ultimately saddle taxpayers with the bill for unfunded pensions to retired teachers, firefighters and policemen in many U.S. states. Returns will continue to come up short. The hedge fund consultants sit between the expensive, poorly performing hedge fund industry and the unsophisticated trustees of many public pension funds. The consultants are smart enough to understand the consequences of GASB, and commercial enough to know how to exploit this knowledge by guiding their naïve clients towards complex investments whose sourcing generates further consulting fees. There is a special place in Investment Purgatory for those who ply such a trade. The poor bargain this represents is gradually being acknowledged, often by early adopters including CalPERS who concluded hedge funds were going to create more problems than they’d solve. That attractive hedge fund returns are a mirage is slowly dawning on the not-so-sophisticated institutions whose portfolios include them. The industry remains over-capitalized. Few of today’s investors even think to consider what level of total hedge fund assets is consistent with their aspirational returns. Until they do, continued disappointment awaits. Many years ago, in a different investing climate and a different decade, a cut in interest rates was usually regarded as a stimulative move by the Federal Reserve. Lower financing costs were regarded as helping the economy more than hurting it. They certainly help the U.S. Federal Government, as the world’s biggest borrower. The amount of treasury bills issued at a 0% interest rate recently reached a cumulative $1 trillion. Although declining interest rates adjust the return on lending in favor of the borrower and at the expense of the lender, a lower cost of capital stimulates more borrowing for more investment and consequently boosts demand. However, the intoxicating nectar of ultra-low rates is gradually losing its potency, and while it’s overstating the case to say that markets would cheer higher rates, certain sectors would and the confirmation of an economy robust enough to prosper without “extraordinary accommodation” as the Fed puts it would be novel to say the least. Several major banks released their quarterly earnings over the past week. Balance sheets continue to strengthen, but another less welcome trend was the continued pressure low interest rates are imposing on income statements. Deutsche Bank expects most major banks to report declining Net Interest Margins (NIMs) as older, higher yielding investments mature and are replaced with securities at lower, current rates. JPMorgan expects to make further operating expense reductions since quarterly earnings were lower than expected. It’s a problem facing millions of investors. The timing of a normalization of interest rates, which is to say an increase, is both closely watched and yet seemingly never closer. If you look hard enough you can always find a reason to delay a hike, and the Yellen Federal Open Market Committee (FOMC) looks everywhere. Recent speeches by two FOMC members suggest a December decision to hike may not receive unanimous support. 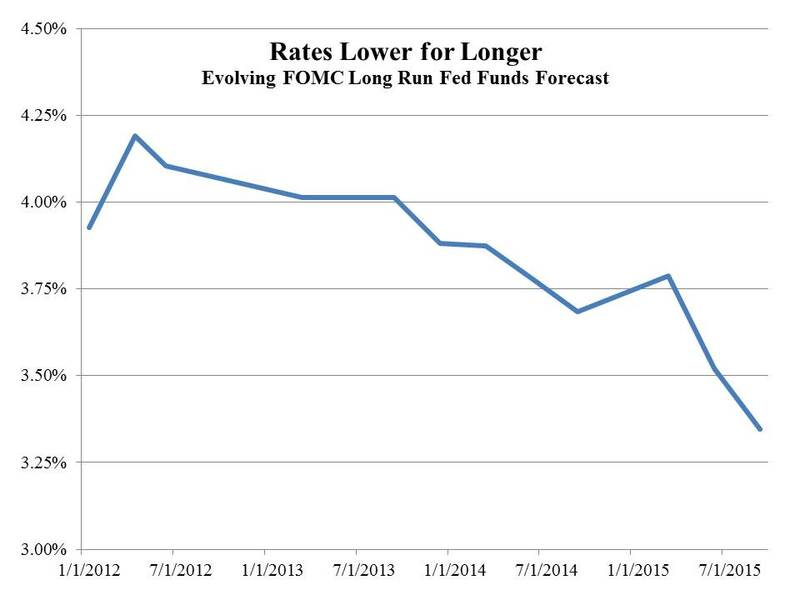 The FOMC’s long run rate forecasts continue to drop, as shown in this chart (source: FOMC). Income seeking investors are unlikely to find much solace in the bond market. As I wrote in Bonds Are Not Forever, when rates are punitively low, discerning investors take their money elsewhere. Suppose you could buy equity in a hedge fund manager, a fanciful suggestion because they’re virtually all privately held. But suppose just for a moment that such a security existed. The question is, how should you value this investment? What multiple of fees to the manager would you be willing to pay or in other words what yield would entice you into this investment? Hedge fund managers don’t need much in assets beyond working capital and office equipment; the assets they care about sit in the hedge fund they control. So let’s consider a hedge fund manager’s balance sheet which consists mostly of a small investment in its hedge fund, representing a portion of the hedge fund’s total assets, and a bit of cash. It has virtually no debt. Our hedge fund manager earns income from its hedge fund investment, as well as a payment for managing all of the other assets that sit in the hedge fund. These two revenue streams are roughly equal today and constitute 100% of the hedge fund manager’s revenue. The fees charged by the hedge fund manager for overseeing the hedge fund aren’t the familiar “2 & 20”, but are instead are currently 13% of the free cash flow generated by those assets and 25% of all incremental cash flows going forward. Moreover, the equity capital in the hedge fund is permanent capital, which is to say that investors can exit by selling their interests to someone else but cannot expect to redeem from the hedge fund. Meanwhile, our hedge fund manager can decide to grow his hedge fund and thereby his fee stream for managing its assets by directing the hedge fund to raise new capital from investors. This represents substantial optionality to grow when it suits the manager by using Other People’s Money (OPM). This hedge fund’s assets are not other securities but physical assets such as crude oil terminals, storage facilities and pipelines. The hedge fund is returning 9% and is expected to grow its returns by 4+% annually over the next few years. The hedge fund manager in this example is publicly traded NuStar GP Holdings, LLC (symblol: NSH), the General Partner (GP) for NuStar Energy, LP (symbol: NS). NSH, by virtue of being the GP of NS and receiving Incentive Distribution Rights (IDRs) equal to roughly 25% of NS’s incremental free cash flow, is compensated like a hedge fund manager. NS, a midstream MLP, is like a hedge fund, albeit the good kind with far more reliable prospects and greater visibility than the more prosaic kind, whose returns have generally remained poor since I predicted as much in The Hedge Fund Mirage four years ago. To return to our question: at what yield would you buy this hedge fund manager’s “fees”, given its option to increase the size of its hedge fund, the hedge fund’s respectable and growing return, the permanence of its capital and the perpetual nature of its substantial claim to the hedge fund’s free cash flow? NSH currently yields 7.6% which should increase ~10% annually over the next several years based on the company’s capex guidance at NS. We are invested in NSH. Last Monday, June 22nd, Energy Transfer Equity (ETE) went public with their rejected merger proposal to Williams Companies (WMB) in an effort to force WMB to the negotiating table. WMB’s stock rose by most of the 32% premium ETE has offered, and in recent days has held on to most of that gain as the market has assessed likely outcomes. ETE’s presentation highlights the synergies of such a combination. Another comforting fact is the ownership of WMB stock by hedge funds Corvex and Soroban, who hold 5.6% and 2.8% respectively. Corvex has not always been a positive influence for stockholders, and last year we wrote about the “Corvex Discount” that should apply to any stock they own (see Williams Companies Has a Corvex Discount). However, in spite of this we are long-time investors in WMB. It’s worth noting that Corvex and Soroban are on WMB’s board, so their views will be a factor in any decision. The headlines will focus on developments at WMB as they consider their strategic options in light of ETE’s interest in them. We think WMB is likely to move higher as a result. What’s drawn less attention is the likely outcome for Williams Partners (WPZ), the MLP that WMB controls as its GP. On May 13th, WMB announced plans to acquire the outstanding units of WPZ, in a transaction intended to boost WMB’s dividend growth in part through tax gains from depreciating the newly acquired assets from a higher valuation. It’s the same technique used by Kinder Morgan last year to fuel faster distribution growth at KMI when they announced plans to combine Kinder Morgan Partners, El Paso and Kinder Morgan Management into one entity (see The Tax Story Behind Kinder Morgan’s Big Transaction). The tax insight KMI had was that acquiring assets from a limited partnership allows them to be revalued at the purchase price, and thereafter depreciated against taxes from this higher level. The practical consequences were $20 billion in tax savings for KMI which helped fuel a doubling of their forecast dividend growth to 10%, and an unexpected tax bill for Kinder Morgan Partners unitholders since the transaction resulted in a sale of their LP units not necessarily at a time of their choosing. WMB’s previously announced plan to acquire outstanding WPZ units is also driven in part by this favorable tax treatment. However, ETE’s merger proposal is conditional on WMB dropping its announced plans to buy WPZ. ETE doesn’t want that transaction to go through. As a result, although WMB’s stock rose substantially following the announcement, the price of WPZ units fell. To understand why, you have to regard MLPs as hedge funds and MLP GPs as hedge fund managers, a view we’ve long articulated and one evidently shared with the senior managers of many MLPs (see Follow the MLP Money). If you want to control the assets of a hedge fund, you do that by controlling the hedge fund manager, not by investing in the hedge fund. Similarly, Kelcy Warren (ETE’s CEO) understands that to control the assets owned by WPZ he need only control WMB’s GP, not WPZ itself. Under this analysis, paying a premium to acquire WPZ units may not be the best use of capital, and in fact leaving WPZ as a publicly traded MLP (albeit with two thirds of its LP units owned by WMB) provides optionality. If WPZ’s cost of capital falls, ETE may drop assets into it where they can be cheaply financed. Or, if WPZ’s yield remains high they may retire some LP units. Having WPZ remain out there is, in ETE’s view, a good thing. It shows that the decisions get made by the owners of the MLP GPs, not the MLP unitholders themselves. As we’ve said before, the MLP GP is like a hedge fund manager. The other day someone was asking me for a simple explanation of how MLP General Partners (GPs) enjoy a superior position to those of the LP unitholders in the MLPs they operate. There are many ways to show that, but I thought I’d pull some information from the recent 10K filed by Plains All America (PAA), a well regarded MLP that’s controlled by its GP, Plains GP Holdings (PAGP). In other words, owning units of PAA won’t allow you to influence the business. This illustrates how the GP gets an increasing portion of the cash generated by PAA. Even if PAA grows its business by issuing new debt and equity to fund expansion, the GP is entitled to its share of this bigger business without having to put up additional capital. It’s like a hedge fund or private equity manager. Owning more than one fifth of the LP units means you lose your vote, so it takes a minimum of four independent owners of a block of securities acting in concert to get around this. PAA is a very well run business with highly regarded management, so there’s little reason for investors in PAA to be dissatisfied. But given the preferential economic and governance rights described above, if you can control PAA through ownership of PAGP, why wouldn’t you? On another topic, last June shares in Targa Resources Corp (TRGP) closed at $150 on hopes Energy Transfer Equity (ETE) was about to buy the company. When the deal fell apart TRGP’s stock fell. Little more has been heard on the topic, and much has happened in the energy sector since June including a collapse in the price of crude oil. In the meantime, TRGP trades at $100, down by a third or more from its potential value in a deal last June. TRGP recently acquired Atlas Pipeline Partners and Atlas Energy, increasing its asset footprint. TRGP yields 3.2% and its dividend has been growing at 29% annually, likely making it an accretive acquisition for ETE whose CEO Kelcy Warren is looking for M&A opportunities exposed by the drop in crude oil. We are invested in PAGP, ETE and TRGP. We’ve long advocated investing in the General Partners (GPs) of Master Limited Partnerships (MLPs) rather than the MLPs themselves. Most importantly, the GPs have preferential economics in the form of Incentive Distribution Rights (IDRs) which entitle them to up to 50% of the Distributable Cash Flow (DCF) the underlying MLP gener ates. This entitlement is immune to additional issuance of equity, so GPs in effect maintain their economic stake even while the MLP grows its asset base funded with new issuance of equity and debt. In this way, MLP GPs are like hedge fund managers, in that asset growth always benefits them economically. MLP LP unitholders are similar to hedge fund investors in that asset growth may benefit them depending on the return on those additional assets. MLP sponsors have long recognized the benefits of the GP. 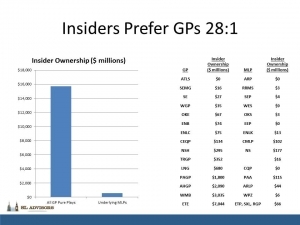 It’s most powerfully illustrated in the chart at left (source: SL Advisors) showing insider ownership of GPs versus the underlying MLP. By a factor of 28:1 the money invested by the people who run MLPs favors GPs over the underlying MLPs. Not every MLP has a GP. Some have bought their GP back, creating a single class of equity. But where an MLP has a GP, if you invest in it you’ll most likely be aligning your interests with the insiders. By a factor of 28:1. Tetra Technologies (TTI) is a small oil and gas services company. Small cap energy was perhaps the least pleasant place to be invested since last Summer, and TTI’s stock duly fell from $13 last Summer to $5 recently (it closed on Friday at $5.38). TTI owns 42% of Compressco LP (CCLP), an MLP that provides compression services all along the natural gas value chain from the wellhead to gathering and processing, storage and distribution. The value of TTI’s LP interest in CCLP is $230MM based on Friday’s market prices. However, TTI also owns the General Partner (GP) for CCLP. Although the GP Incentive Distribution Rights that TTI received was less than $1MM in 2014, CCLP’s growing cashflows will soon be lifting TTI’s split up towards the 50% maximum of CCLP’s Distributable Cash Flow (DCF). CCLP has a conservative 1.7X coverage on its distribution. But based on the outlook for its DCF growth, we think these IDRs could soon be generating $20MM annually for TTI. Applying a 30X multiple (a reasonable assessment for GP IDR cashflows) values just TTI’s GP interest in CCLP at around $575MM. That’s without including any value for the 42% of LP units that TTI already owns, or TTI’s other energy services businesses. TTI expects its LP interest in CCLP to generate $32MM in DCF in 2015. This is worth $400MM, or $5 a share at TTI’s multiple or at CCLP’s current price, which seems undervalued with an 11% yield and 1.7x coverage, $244M (about $3 per share of TTI). TTI’s current Enterprise Value (EV) is $834MM and its market cap is $432MM. GAAP accounting requires that TTI consolidate CCLP’s debt on its balance sheet although CCLP’s debt is not guaranteed by TTI. On this basis TTI’s EV is $1.3BN, and likely makes TTI’s balance sheet appear more leveraged than it will soon when the GP IDRs start generating more cash. TTI has a legacy E&P business (Maritech) that has been a significant drag, but they should be finished with its remaining liabilities this year. The rest of TTI’s business should be able to generate around $80MM in free cash flow annually. We think we could be close to an inflection point in CCLP’s ability to generate increasing cashflows which will reveal the value in the IDR’s TTI owns as they move up to higher splits. We think TTI has substantial upside from current levels. Although TTI is not traditionally regarded as an MLP GP, much of its potential upside comes from that element of its valuation. Another interesting transaction that took place earlier in the week concerned the acquisition by Western Gas (WES) of Anadarko’s (APC) 50% interest in the Delaware Basin JV gathering system. APC is WES’s sponsor. What’s unusual about this deal is WES doesn’t have to pay for the assets it’s acquiring until 2020. At that time, it will pay eight times average 2018-19 EBITDA less capex. WES will receive cash from its newly acquired assets immediately, and of course so will Western Gas Equity Partners (WGP), the GP of WES that is still 88% owned by APC. Paying for something in the future at a reasonable multiple based on its performance while enjoying cashflows immediately doesn’t happen every day, and in this case required the benevolent control of WES by APC. WGP benefitted without having to contribute any capital to the transaction, once again illustrating the power of the GP. We are invested in TTI and WGP. This morning Energy Transfer Partners (ETP) agreed to merge with Regency Energy Partners (RGP). Terms included an equity swap whereby RGP holders will receive 0.4066 ETP units and $0.32 in cash for each RGP unit they hold. ETP is also assming RGP’s debt. Energy Transfer Equity (ETE), ETP’s General Partner, already owns the GP and Incentive Distribution Rights (IDRs) for RGP. However, the IDR’s were only at the 25% split level with respect to RGP, meaning that ETE was receiving 25% of RGP’s Distributable Cash Flow (DCF), whereas ETE is at the 50% splits on its share of ETP’s DCF. Simply put, prior to the merger ETE was getting more of each dollar generated by ETP than it was from RGP. Following the merger, RGP’s DCF will in effect be subject to the same 50% split at ETP’s. ETE has agreed to forego $320 million of IDR distributions over the next five years as a sweetener. It is nonetheless a nice deal for ETE and the relative performance of the stock prices reflects this. ETE is currently up over 4% reflecting its improved cashflow outlook, while ETP is down more than 5%, perhaps in part because of the issuance of additional units. RGP is up because the terms of the transaction represented a premium to RGP’s Friday close. RGP’s projected 2015 distribution yield was 8.9% prior to the transaction compared with 6.6% for ETP, so even allowing for the modest premium the transaction is still accretive to ETP. Importantly though, ETE investors most notably including CEO Kelcy Warren did not have to provide any capital to make this transaction happen; it’s been funded by ETP, as directed by ETE, its GP. The subsequent entity will also have a stronger balance sheet with a lower cost of debt, making future acquisitons easier to execute. It highlights the advantages of investing in the General Partners of MLPs. They have all the control, and can execute M&A transactions that improve their economics with little or no obligation to provide additional capital. We are invested in ETE, as is Kelcy Warren who owns almost 80 million units of ETE worth around $4.5 billion. He figured this out long ago. Assuming you’re not the type of investor whose mood is synchronized with the daily gyrations of the stock market, October has been an interesting month. Although it’s not over yet so of course anything can happen, to this point October looks like a big, short-lived margin call. Leveraged investors and those who like to hedge their downside have had a torrid time and many must regard their recent activity wondering how so much frenetic portfolio adjusting could have been so harmful. It will be especially interesting to see how hedge funds finish the month. Industry apologists long ago perfected shifting the goalposts of performance. What was once the Absolute Return industry moved to generating attractive relative returns, later supplanted by uncorrelated returns as each description of the performance objective was found to be at odds with the empirical results. Nowadays sophisticated hedge fund consultants promote downside protection as the raison d’etre of a hedge fund allocation. So what to make of the way October is shaping up? Through yesterday, the S&P500 was down 1.6% for the month, an innocuous result that scarcely describes the wealth adjustment that was inflicted earlier. MLPs, in which we have more than a passing interest, were at one point down 14% before the V-shaped market move thankfully began its ascent. Hedge funds, as defined by the HFRX Global Hedge Fund Index, are currently estimated to be down 2.5%. Many hedge funds, particularly those focused on equities, have done far worse. Stocks may of course spend the rest of the month falling, but assuming they don’t one imagines there will be some uncomfortable conversations as investors contemplate the value destruction that’s possible when hedged strategies test the market timing skills of their practitioners beyond the level of their ability. It’s a fair question to ask that, in a market environment characterized by a sharp trip down followed by an equally fast return, what exactly should a hedged strategy return? Presumably, if a hedge fund maintains constant exposure, the round trip ought not to be much different than for the long only investor. But it’s looking very much as if the risk management being practiced is of the “dynamic” variety, which is to say highly responsive to market moves, or perhaps less generously, prone to sell low and buy high. It reminded me a little of the crash of October 1987, whose 27th anniversary of course just passed on Monday. Not nearly as traumatic of course, and spread over a longer period of days, but what both events have in common is the use of hedging strategies that rely on risk reduction in response to falling prices. In 1987 it was called Portfolio Insurance. Its 2014 version has more complexity and variety of implementation, but thematically is another version of taking more risk when prices are rising and less when they’re not. There are other ways to grow your savings.